Ramanagara District Deputy Commissioner Mr.V.Ponnuraj has said the election commission has issued strict guidelines to curb any mischief during elections on May 10. 16 companies of Central Forces will be deployed in the district he said. No person with out his election identity card can cast his vote, the deputy commissioner has repeated. How ever if a voter doesnot have his election identity card he can produce any valid document with his photo as proof and cast his vote. The alternative proof includes, pan card, driving licence, bank pass book with photo etc. Seen in picture the deputy commissioner Mr.V. 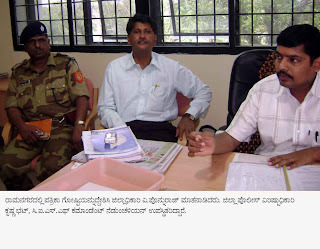 Ponnuraj with Superitendent of Police Mr. Krishna Bhat and Commandant of C.I.S.F Mr. Nedunchizian.